Skylines help your landscape designs look more realistic by surrounding them with scenery. Check this option to add a skyline. Click the picture of the skyline to select a new one. Adjusts the size of the skyline, making it appear closer or farther away. Adjust the size as needed to best compliment your particular design. Rotates the skyline, so you can align the desired features with your landscape design. The following shows a landscape design with and without a skyline. 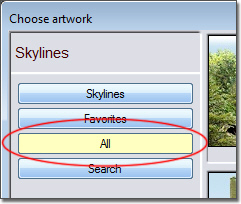 You can create and import your own custom skylines using the following steps. 1. Using Photoshop (or similar program), create two images, each 2048x512 pixels in size. 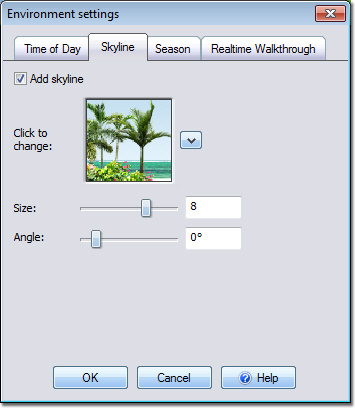 The first image will be the main skyline image (which will appear in the skyline only once), and the second will be automatically repeated by the software as needed to surround the entire landscape. 2. Remove the sky from both images. 3. Create an alpha channel with white for areas that are opaque, and black for areas that are transparent. Where "c:\Program Files (x86)\ Realtime Landscaping Pro" is your program installation directory, and version is the software version number. On 32-bit systems, replace "Program Files (x86)" with "Program Files". 6. Stop and restart Realtime Landscaping Pro.